Phytronix offers comprehensive repair and maintenance services for all of your laboratory instruments. Our multidisciplinary team has in-depth knowledge and technical expertise to perform all analytical instrument repairs with a fast on-site response time and at a competitive price. The Contract Agreement is the equivalent of a manufacturer’s service contract but for a competitive price. The Bank of Service Hours and Combo Bank of Service Hours + Parts are prepaid hours with a guaranteed response time used to cover all repairs and/or maintenance of your analytical instrumentation, regardless of manufacturer or age of your equipment. The usage of service hours is solely controlled by you. 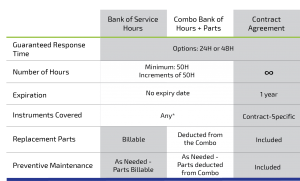 In the Combo Bank of Service Hours + Parts, you allocate funds in both a Bank of Service Hours and Parts. The funds assigned to Parts can be used to order replacement parts or consumables. It can be transferred into the Bank of Service Hours at any time. *Some restrictions apply. Contact us to know if your instrument is covered. Use our experience to your advantage! We can offer strategic insights for selection, delivery and implementation of new or used analytical instrumentation into your lab. See the Laboratory Design section to learn more about how we can help with your infrastructure design planning. Our team of experienced Chemists will help you develop robust analytical methods for LC-MS/MS, HPLC/UV or HPLC/FL. From optimizing your sample preparation to in-depth instrument and application support, our dedicated team will provide a tangible advantage to your laboratory. We offer personalized courses to help your team acquire theoretical and practical training on any advanced analytical instrumentation. Phytronix offers courses in Mass Spectrometry and on most separation techniques used in the laboratory. The courses are designed to correspond to your specific needs and can be adapted in duration and group size. Over the last decade, Phytronix has designed several ‘top-of-the-line’ laboratories and we pride ourselves on the quality of our performance. Our experienced team of engineers can manage your laboratory design and relocation needs. We work directly with architects and contractors to manage all aspects of your laboratory design from infrastructure consulting to Turnkey project delivery, including lab conceptualisation, electrical specifications, training, ventilation as well as safety compliance. Our relocation and installation team will ensure that all your instruments will be handled with care an reinstalled in optimal conditions, ready to be used in your new facility.